Important information: To stay at Éthic étapes Patrick Varangot, anyone under 18 must be accompanied by a legal representative, someone 18 years of age or older. Situated only 150 meters from the beach and 2 kms from the historical center of the city. Éthic étapes Patrick Varangot is only a 1 hour drive from the Mountain St Michel. Staff were extremely friendly and helpful. The food was of good quality and price. Great location and marvellous staff. Only thing is that wifi is available for free only in common spaces. Excellent! A great place away from hustle-bustle Paris!!! It is quiet, peaceful, serene .... It is so very near the beach i.e. walking distance. Warm reception. The personnel commented about my travel from far-away country, from Malaysia to St. Malo. Great breakfast, eventhough they serve the same menu every morning. I like the French bread. There is a lovely kitchen for residents with all utilities provided e.g. a locker refrigerator (must pay a fee) Summer is best time. Suggestion : PLEASE make it clear on the webpage that checkin is NOT possible before 4pm and c/o is strictly at 10 am Perfect for a solo traveler. I stayed there from 31-Aug-2018 to 2-Sep. Location and cleanliness are super cool. After a busy day walking in the old town or around the beaches - and I bet a solo traveler without a car does a lot of walking - one can expect a very comforting sleep in a nice location with clean air. The two nights that I slept there, I had really comfortable sleep. Not a lot of security options. However the location well made up for it. 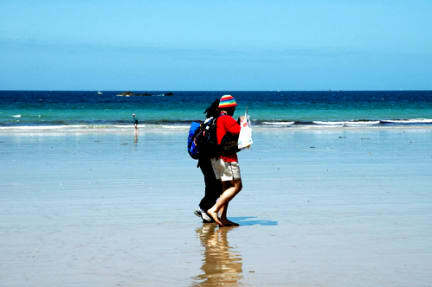 Less than a 3 minute walk from the beach and less than a 40 minute walk to the old town of St. Malo. Hi stayed here on my own for two days in november.This hostel is OK, it does the job, It's located in a youth residence in Saint Malo, meaning you'll be seeing lots of 16-24 year olds around. 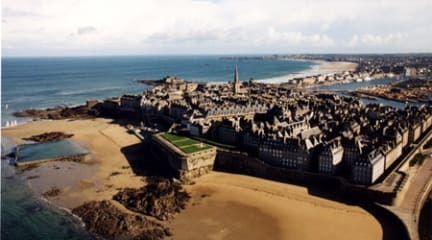 Location wise, it's a bit far from Saint Malo's historical town (45 min walk). You can get the bus and it's quick to get there, but buses didn't run at night and I could not even find taxis. Rooms are very small & very clean. Breakfast is included but it's really bad.